Room 101 is giving Tatuaje a run for their money. They have applied the same mystical approach to their cigar production and marketing. 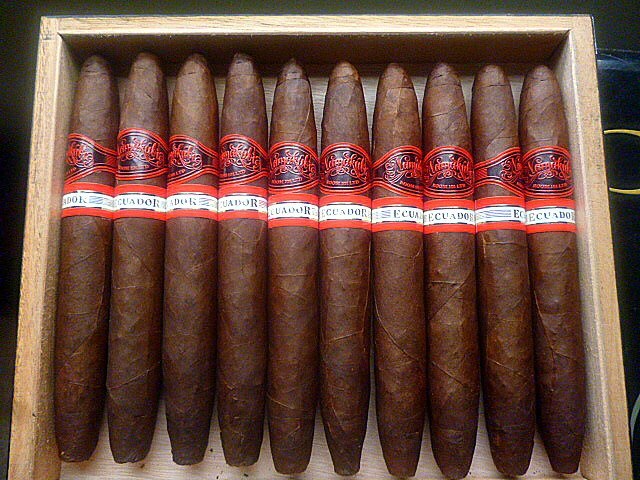 Certain cigars are always available and others are small batch lines that you better jump fast. I became a big fan of Room 101 and Matt Booth over a year ago. As I reviewed his earlier cigars, my gut told me that this young man is a mensch and knew what he was doing in the blending room. 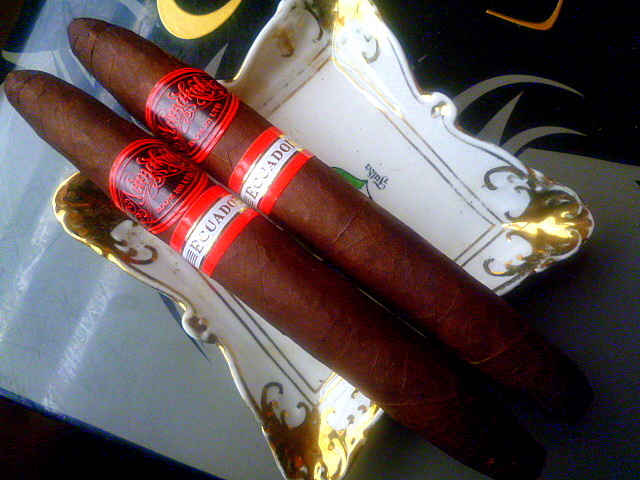 The Room 101 San Andres is still one of my favorite cigars. 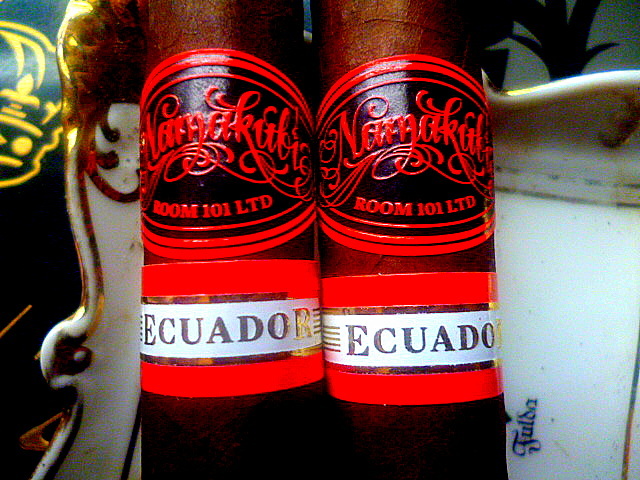 But the Room 101 Namakubi Ecuador is making it hard to decide. 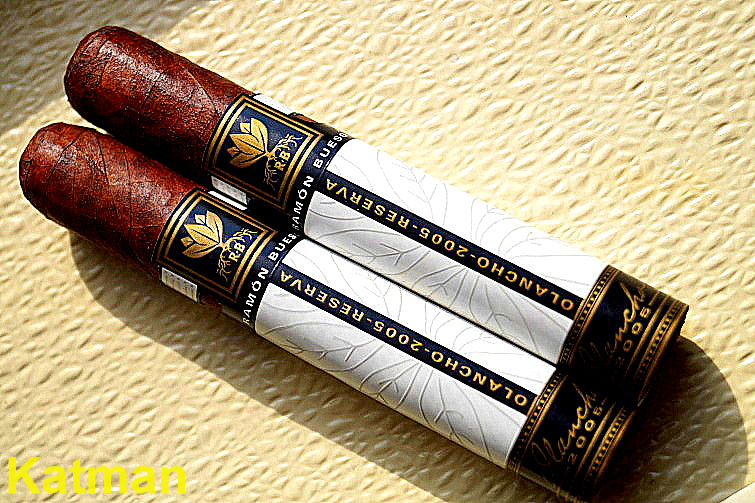 BTW- I bought these cigars from Atlantic Cigar. I have become a fan since I discovered their VIP Club. More on that later. Now comes the Namakubi line based on Samurai stories. I bought a box of the original line when it came out and I parse them out slowly and by doing so, reap the benefits of them aging in my humidor. The Ecuador is a different animal although it is sort of Frankenstein’s monster made up of a little of this and a little of that. The wonderful wrapper of the Room 101 OSOK was used here; as well as its binder. 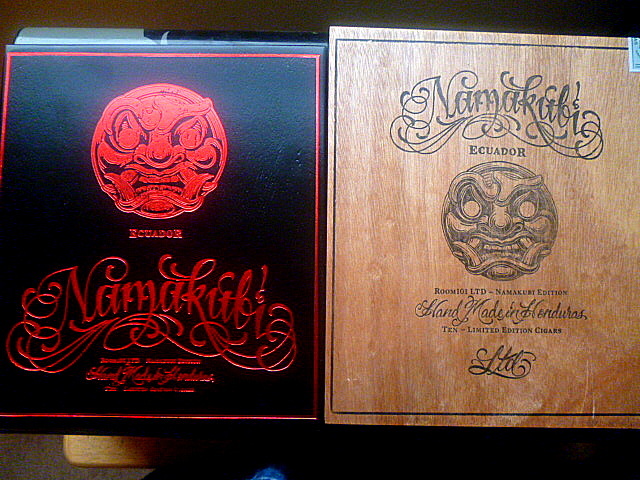 And the filler from the original Namakubi. I bought a 10 count box of the Ranfla. A gorgeous perfecto shape. Or is it diadema? No one can agree. Construction is close to flawless. 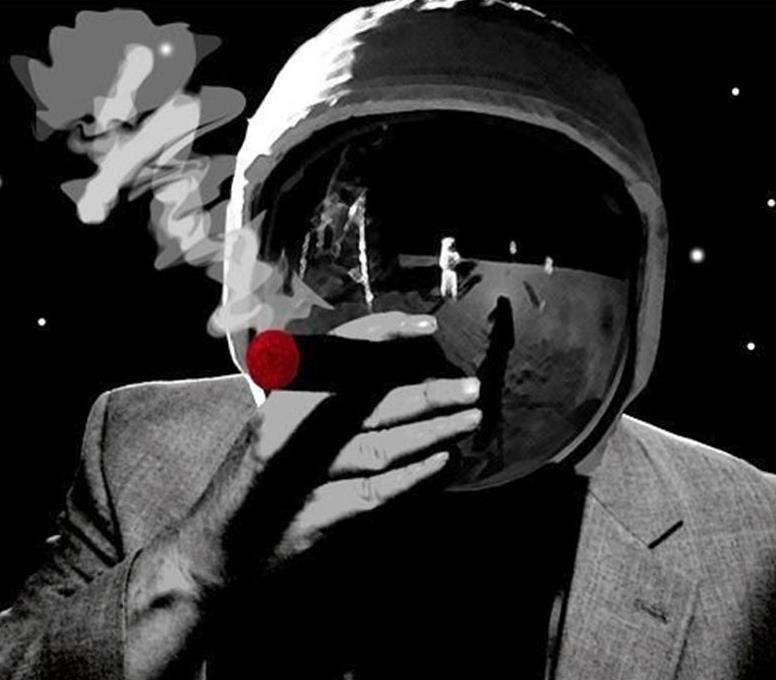 The cigar is solid. With just the right amount of give. 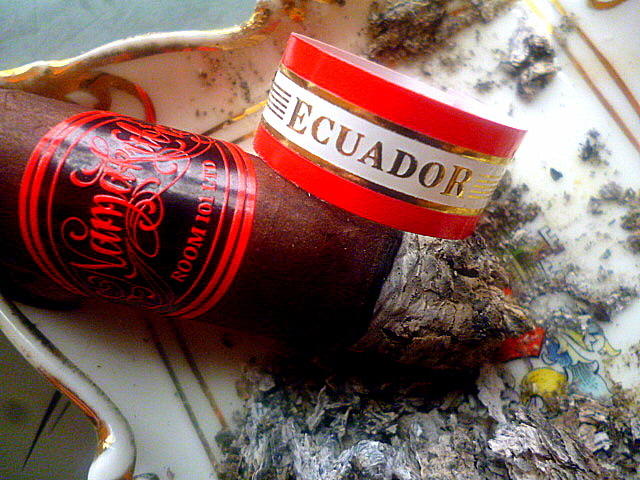 The beautiful Ecuadorian wrapper has that dark brown with a tinge of reddish hue. Seams are invisible. There are a few veins but in this case, they give the stick character. I don’t know how many caps were used. But it is beautifully done. It is a very oily stick with the slightest of toothiness. I do the sniff test and detect gorgeous floral notes around the body. I also smell spice and cedar. At the foot, there is an intense aroma of cocoa and spice and some sweetness. I clip the cap and light up. I use my large stainless steel table cutter with two guillotine sizes and two V cut sizes. The small V gives me a flawless snip. On first puffs, I get that delightful sweetness. A bit of cocoa. And that floral aroma turns to a flavor component. Like honeysuckle. The burn goes rogue on me and a hole forms about half an inch away from the foot. I have never had this happen. I don’t know what to do. Should I clip away the foot of the cigar? Should I leave it alone? It has turned into just a black hole now. It is not burning. I smoked my first cigar yesterday and this did not happen. I am chalking this up to lousy karma for a cigar review. I should overtake the hole very shortly. It does have an effect on the draw. Sort of like not putting your finger on a bong. When I place my finger on the hole, the draw is perfect. Woodstock – The Return. I am now getting the taste of coffee and wood. With a bit of spiciness. There is a yeasty, toasty flavor as well. 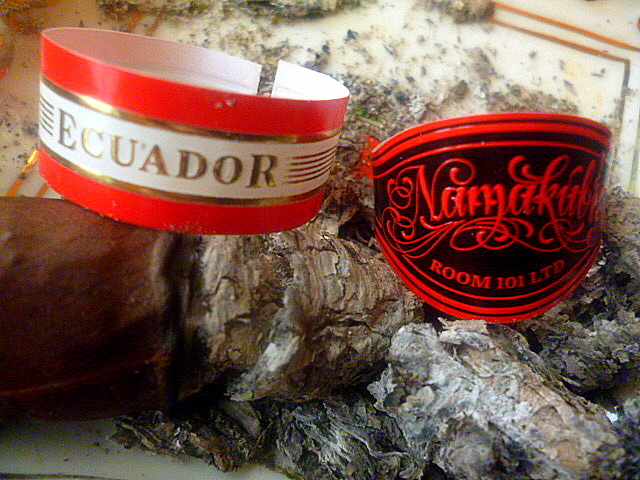 Even at this early stage, the Ecuador is nothing like the original Namakubi. .This is a more aggressive stick. The flavors become intense quicker. 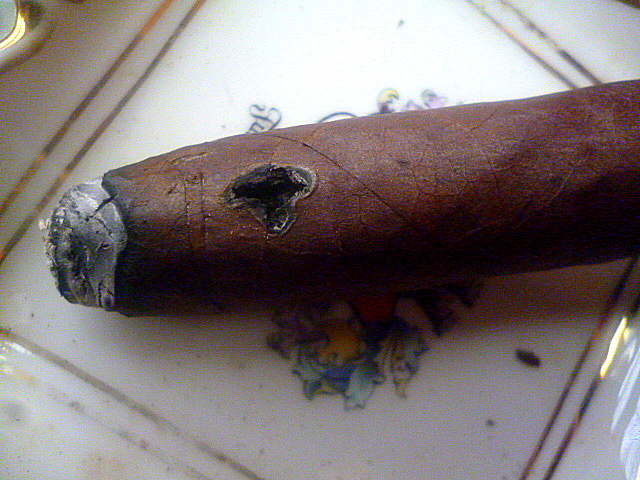 The hole has now been consumed by the cigar gods and the draw is so perfect that it enhances the flavor profile. The red pepper is much stronger. The coffee effect is way ahead of the pack. There is some cocoa trying to break free but is held back by the coffee. That hole screwed up what would have been a perfect char line. I am forced to correct it or it will tunnel; or canoe. Creaminess shows up in the first inch. A very good sign. There is a flavor that is either oak or nuts. I can’t tell. I should, but I can’t. The spiciness is ramping up. I like that. The corrected char line seems to be doing just fine now. 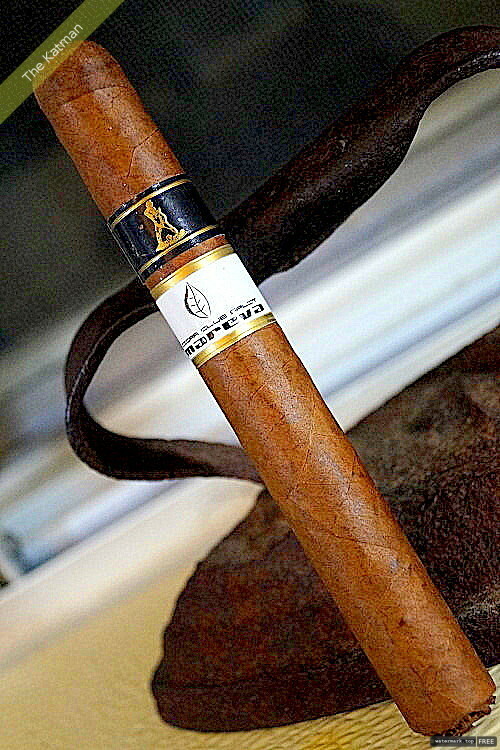 I have to add that this shape and the beautiful band make this a classy looking cigar. I have always liked the perfecto shape because of the small cap. It is easy to chomp on while smoking and I like to chomp; especially while I am typing. 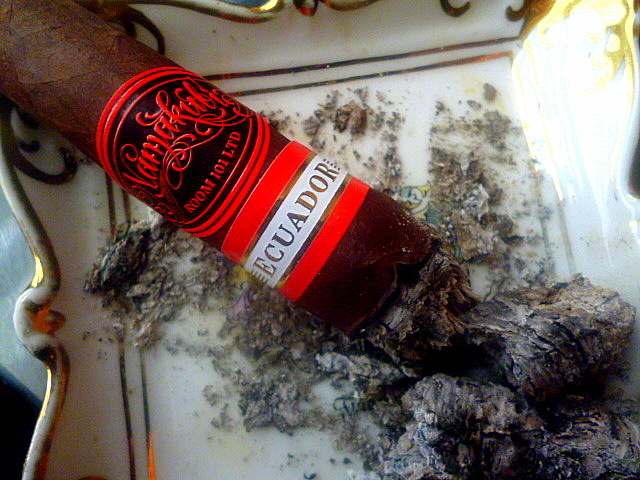 This cigar is packed with tobacco leaves and so it is a slow burner. I’ve been smoking this stick for a good 20 minutes and I have only burned down an inch or so. Out of nowhere, the flavors expand. The cocoa takes the lead, the creaminess comes in waves, the sweetness becomes caramel, and a deep earthiness arrives. I expected this but not until the halfway point or later. Man, this is good. Smoke begins to pour from the foot. And if it weren’t such a dreary, rainy day…I could get some great smoke photos but I need natural light for that as I have a crap camera. All I can say as I begin to leave the first third is that I think great things await me in the other two thirds. With each puff, flavors get stronger and more apparent. A complexity begins to form. I am now getting a citrusy note as the second third arrives. It is lemon zest. This component gives it a nice tart sensation that offsets that sweetness of the caramel gracefully. The spiciness continues to close in on me. My tongue tingles. My nose is running. This is great. There is the perfect amount of spice and there is going overboard. And this is in perfect harmony with the other flavors. The burn line never seems to get back on point completely but still is within the acceptable parameters. 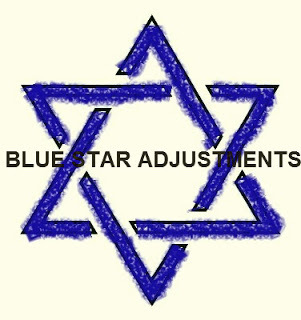 No further adjustments need be made. It is raining and I can see it from where I type in the living room. I kick back in my big leather writing chair and just mellow yellow, baby. The house is dead quiet. My wife is off work today and is out cold upstairs. The dog is snoring beside her. All I can hear is the pelting of the window with rain. And the occasional thunder clap. 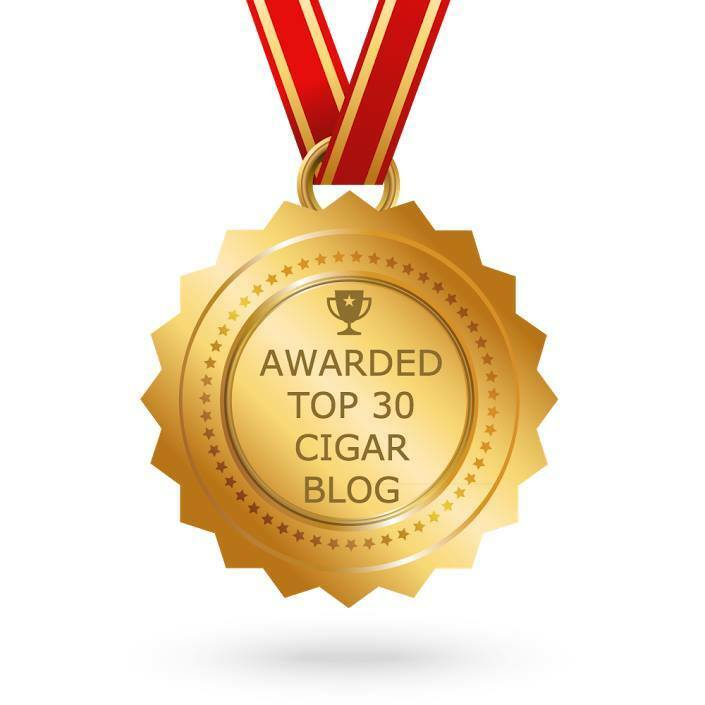 I want to enjoy this cigar and it’s not going anywhere in a hurry so this is a luxury when writing a review. I would love to buy a shitload of these boxes. But like most people, I am on a budget. It is nice when manufacturers send me cigars but that is a small portion of what I have in my humidors. I belong to the Atlantic Cigar VIP Club. They provide discounts on cigars. Some big, some small. And sometimes, not at all. But because of this club, I can more readily afford cigars I would not be able to buy. You should check this out. It is a lifesaver for me. 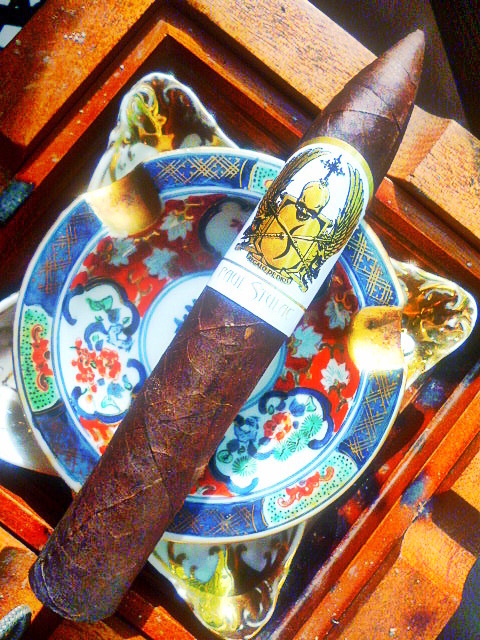 I pass the halfway point and the cigar becomes a flavor bomb. The biggest change is its complexity. The flavors no longer stand alone; like the cheese. But rather, they have melded into one giant flavor experience. This is a killer cigar. And the $9.00 price point is pretty good. I know it’s a lot for some people. The economy has decimated the buying power of cigar smokers everywhere. But considering the quality of this cigar, Booth could have asked for more dough. 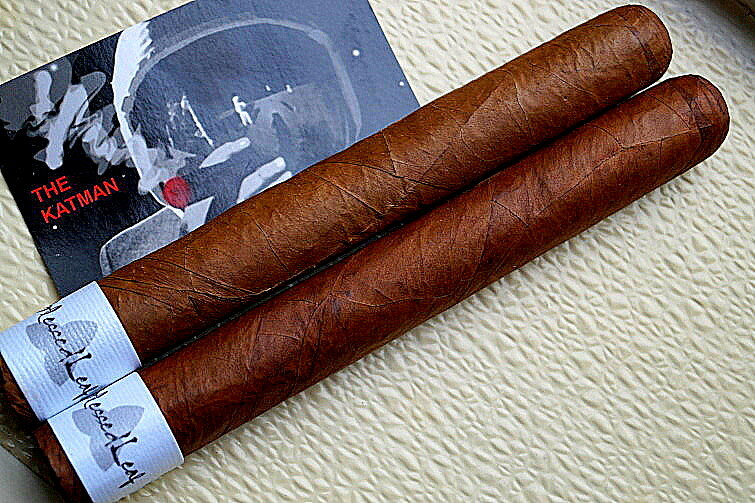 And Atlantic Cigar is kind enough to allow you to buy one cigar for $9 and a box for $90. Thereby, not punishing the buyer who may only want a couple. This is rare in online stores. The other stores usually tag on a couple extra bucks if you buy a single. Not nice. Something odd going on here. This blend is called out at 5.5” long. I measured it because it looked longer and it is. It is 6.25” long. Of the four blends in the line, none are this length. Puzzling. I enter the last third at the 90 minute mark. The cigar finishes out with a flourish. All flavors burning on 12 cylinders. The strength, which started out as classic medium, is now closer to full bodied. I don’t want this cigar to end. 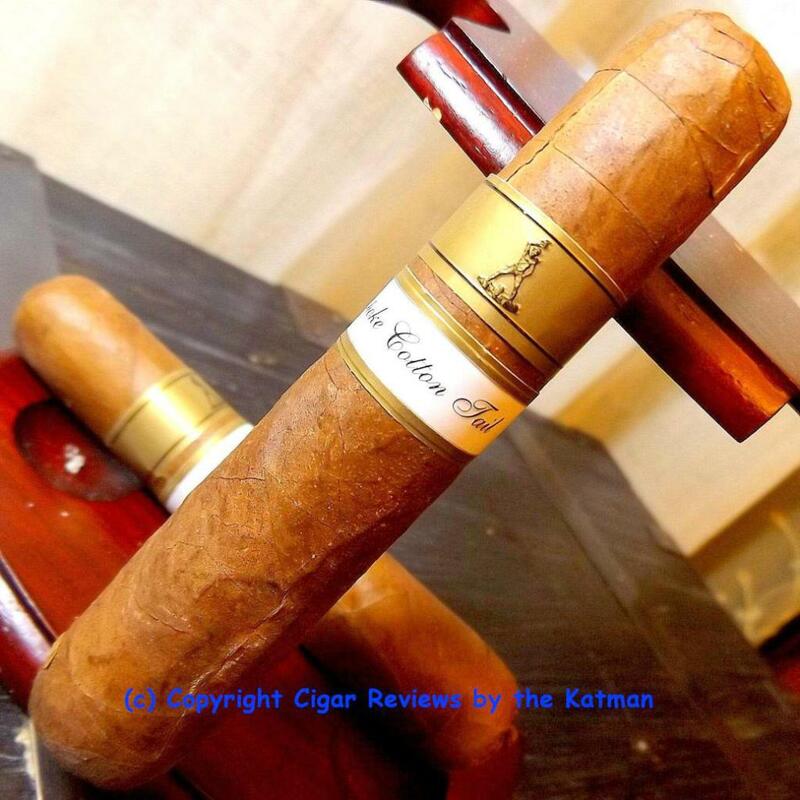 Matt Booth made this cigar all about flavor and he succeeded admirably. Good on you, Matt.